Certainly as we accompany the Church from the First Sunday of Advent to Christmas Eve, we are exposed to many traditional and beautiful readings from scripture and powerful themes for our edification. We look back historically – and hear the prophets proclaim the Messianic Age. We look forward prophetically – to the Great Mystery of the Final Coming of Christ. We live the present expectantly – preparing for Christmas and our encounter with Christ! In a General Audience in 2002, John Paul II spoke of the Church providing us with 3 guides for Advent: The Prophet Isaiah, John the Baptist and Mary the Mother of Jesus. In the Penitential Season of Lent – we discover our Savior and our need of Redemption. In the Penitential Season of Advent – we seek a Baby and contemplate His Incarnation. 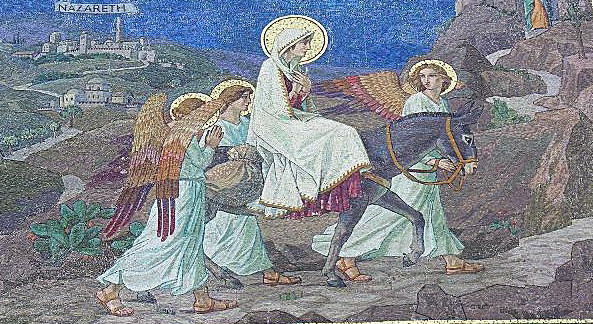 One way to travel your Advent weeks to Christmas is to accompany Mary (and Unborn Jesus) on her (and His) nine month journey. Their journey together is gestational and spiritual….but when you join them on their journey it becomes very personal. Enter into the Mystery of the Incarnation. Mary is overshadowed by the Holy Spirit and conceives the Son of God – then she leaves in haste on a 4 day journey to the hill country of Judah to visit her pregnant cousin Elizabeth. When she arrives remarkable events unfold – her unborn Child right in the middle of it all (CCC #717). On one level, Mary is visiting Elizabeth, on another level, God is visiting His people. You can join in this visit. Three months later, Elizabeth gives birth to her baby John, and shortly thereafter, Mary (and Unborn Jesus) return to Nazareth. Trusting Joseph encounters Mary (and Child) and becomes perplexed, then resolved upon a course of action. But God introduces into the marvelous mystery of the Incarnation a simple human institution called ‘adoption’. The angel of the Lord visits Joseph in a dream and the rest is salvation history. You can visit Nazareth during the second and third trimesters of this singular Redemptive Pregnancy. Travel to Bethlehem with the Holy Family. Witness the rejection this young pregnant mother experiences as the door to the inn is closed in her face, and the babe in her womb vigorously stirs within her. Behold Joseph’s resolve now. Watch God the Father provide for the birth of His Son. The angels tell all! The shepherds teach all! Finally, you can welcome God’s newborn newfound Love at journey’s end with worship and a promise to be childlike yourself, and always respectful of the child.